Reference Optical Quartz is the first of its kind, consisting of 210 separate boro-silicate glass fibres. The cable allows you to experience stunning sound when connecting DAC's, TV’s, CD players and Blu-Ray players to amplifiers or receivers because it has double the bandwidth and only 1/10th of the attenuation of traditional acrylic fibres. 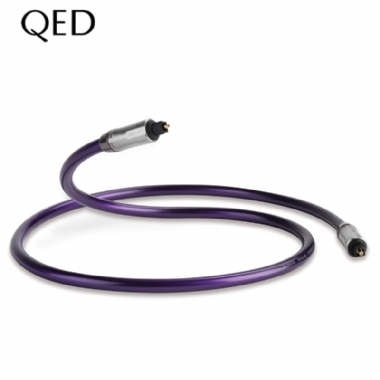 Reference Optical Quartz vastly exceeds the demands for high definition multi-channel digital audio with a bandwidth of up to 12MHz which is totally unaffected by bending the cable. QED's new Glasscore™ technology employs multiple fibre bundles of ultra-fine boro-silicate glass optical fibres (GOF) of no more than 50um each to make up the 1mm diameter necessary to conform to the Toslink standard connectors. Because the fibres are so small the different paths taken by the light rays are similar in length virtually eliminating the timing error and introducing less distortion and jitter. This has the effect of increasing bandwidth and the accuracy of the data transmission. This vastly exceeds the demands for high definition multi-channel HD digital audio and 24/192 files. In contrast to conventional optical cables, it is completely unaffected by bending the cable. Reference Optical Quartz gives over double the bandwidth of single acrylic glass fibres and 1/10th of the attenuation. QED have calculated that Jitter or distortions caused by timing differences between the different light paths in conventional optical cables could typically reach up to 145ps. In Reference Optical Quartz, timing errors are virtually eliminated, introducing less distortion, jitter and ultra low loss < 0.03 dB/m.